You probably know that Mac OS X Lion will add TRIM support for SSD’s, but what can you do right now if you’re on 10.6? 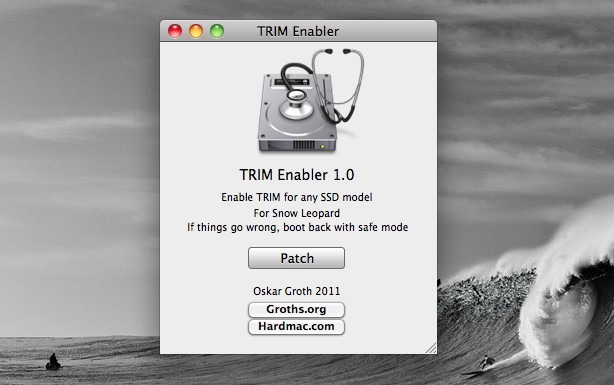 If you’re brave, you can use this unsupported hack that enables TRIM for most SSD devices under Mac OS X 10.6.7. The app is called TRIM Enabler and it works by loading a kernel extension from MacBook Pro 2011 models (with TRIM support) into your Mac OS X kernel, this forces TRIM to be enabled. All you have to do is click on “Patch” to enable TRIM, but the current version does not support one-click disabling, so if something goes wrong, you’ll have to boot into Safe Mode to disable the extension manually. WARNING: This is completely unsupported software. We are not responsible for any damage or data loss that may result from enabling this feature. Always have a backup of your data, and proceed with caution and at your own risk! You can download it directly here or visit the developers site. I have an SSD in a new MacBook Air and I have not tested this, nor do I have plans to test it. Personally, I’m going to wait for official support from Apple, there’s likely a good reason they left it out of 10.6.7. Update: TRIM Enabler v1.1 has been released that includes backup and restore functionality, the download link has been updated to this version. If you read the comments on groths.org there are some negative reviews already. This is too risky to me I would wait too. I tested and i can say that it works. It takes a little longer time when reboot . Good job! I have a Macbook air 2011, 64Gb, 4 gb memory. So far, so good. Just applied to my Mid-2009 Macbook Pro w/ Intel G2 solid state drive. I have the same machine that you do – any issues after you enabled TRIM? I did it and it worked fine except that Google Chrome became unusably slow. I had to disable TRIM to make it usable again. If anyone knows why, I would like to re-enable TRIM. I enabled TRIM on my i7 MBP with Crucial C300 256GB SSD. It worked, but afterwards my Mac would hang at the login window for a good few seconds, and application launches would be similarly sluggish. The system would also periodically hang when doing nothing in particular. The patch also seems to break hardware video acceleration in 10.6.7 for both Flash and HTML5/H.264. (possibly why Chrome was running slowly for you). Since the C300 has native garbage collection, I think I’ll be leaving this feature disabled until an official solution becomes available in 10.7. You should not use this enabler if you have garbage collection integrated in your SSD!! Nice wallpaper. Someone who knows where it can be found? Glad you all enjoyed the wallpapers! I would guess that the “good reason” Apple left TRIM out of 10.6.7 is marketing. Now they can say that Lion increases SSD performance. I could see them adding TRIM to 10.6.8 or .9, after Lion’s initial purchase-wave is over with. Great Patch, worked fine on my mid-2009 MB Pro running 10.6.8 with Crucial C300 SSD, now reports TRIM Supported. I tried to fix with these apps, but these are not working. Anyone know the pinout for a toshiba 256GB SSD? 6 + 12 pin-out signals and the solid gold finger on the 2nd side of the SSD. • The SSD has contacts on only the “bottom” side with what looks like a ground plate on the “top”. • The connector is split with six pins on one card edge and 12 on the other. A one-sided version thus has 18 pins (plus ground) while a two-sided variant has 36 pins. For comparison, Mini PCIe is a two-sided card edge with 8 pins and then 18 pins, for a total of 52 pins. The 1st observation is the pitch is OK; 1mm, but the notch is not! It’s smaller than the Mini PCIe (1.5mm). So it DOES NOT fit the standard Mini PCIe connector.